Home Advices Apple iPhones Jailbreaking Problems security How Can Apple Users Avoid iPhone Spyware? How Can Apple Users Avoid iPhone Spyware? For long iPhone users have criticized and laughed at their Android counterparts on being vulnerable to Android spyware; but not anymore. With changing times and advancement in technology, smartphone attackers are bringing in sophistication in their tactics to inject cell phones with malware. iPhone users now realize that they can also be easily targeted by the hackers, ready to steal and misuse their personal data. Lately Apple has been criticized for acting like cell phone spy software – even a lawsuit was filed against it for privacy invasion, proving that iOS isn’t safe from malware or spyware. iOS lovers can continue to keep their Apple devices safe from such malicious malware by following some simple steps. Some malware can be so sophisticated that they can do their job inside your cell phone without making you aware of their presence. Others have the ability to work in stealth mode. The only solution to get rid of these bugs is to install a decent antivirus on your iOS device. It’s a game of hide and seek, in which the malware plays the role of a culprit, which is caught and eliminated by the antivirus apps, the cops. 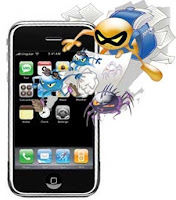 The best approach is to search for a suitable antivirus app on App Store, which cannot only find existing problems but protect your iPhone from future trouble as well. Getting your iPhone jailbreak means losing your super power protection against the threat of malwares - ensuring that your iPhone doesn’t have a warranty. In order to fulfill your desire to have some free apps you not only risk your iPhone’s security, but having a jailbreak also gives a free pass and multiple opportunities of infiltration for malware as well. Although there have been reports of malware attacks on iPhones and instances when App Store has trouble with malware – something to cheer the users – Apple has been able to counter attack and destroy the malwares with equal efficiency so far. For a long time, it was thought that jailbroken iPhones were immune to the threat of malware attacks – with Apple waging war against malware with such tenacity one should feel a little more secure. However, a jailbroken iPhone is a blessing for users. You are responsible for your own safety. If you jailbreak your mobile and install apps outside the parameters of the App Store then you have no one to blame but yourself for the repercussions. iPhones and Android phones are similar in one way – they won’t allow you to choose what permissions you hand over to your apps. Either you have to provide them with your information or you don’t install them. In that case, your personal information, on the hands of the third party can be used in any way, but if it’s from the App Store at least you can sure it doesn’t have any malicious intent. Author Bio: James Clark's work revolves around tracking apps and software. His most recent stint in Cell phone Monitoring has focused on iPhone tracking. Clark's readers follow this work to get the latest scoop on all things tracking.